Origin Costa Rica, Nicaragua, Panama, Brasil, Peru, Venezuela, Suriname, Colombia, Argentina, French Guiana and Guyana. Shapes Small drupe 1-1.5 cm long, black, shining, solitary, globose, with a thin shell. Quassia amara commonly known as Quassia, Bitter Quassia, Amargo, Bitter-ash, Bitter-wood, Jamaica Quassia, Bitter Bark, Quassia Bark and Quassia Wood is a small evergreen shrub or rarely a small tree native to Costa Rica, Nicaragua, Panama, Brazil, Peru, Venezuela, Suriname, Colombia, Argentina, French Guiana and Guyana. It is a member of the Simaroubaceae family. Linnaeus named it after the botanist who first described it, the former slave from Surinam, Kwasimukamba, also known as Graman Quacy. He was a healer who supposedly discovered the medicinal properties of its wood and used it as a secret remedy for the cure of malignant fevers endemic to Surinam. Its species name, amara, is derived from the Spanish word amargo, which means “bitter.” The name fits since the bark of the tree contains quassin, a substance 50 times more bitter than quinine. In fact, it’s the bitterest naturally-occurring chemical known to exist. 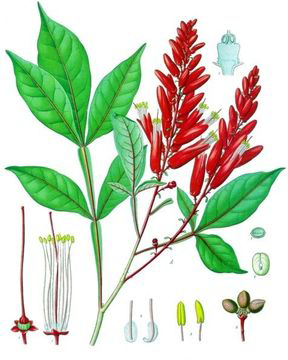 Although quassia bark is an ingredient in herbal bitters in moderate amounts, the presence of these highly bitter phytochemical makes infusions made with this herb very effective natural insecticide. It is the bark of the quassia amara tree that is used in herbal and homeopathic medicine. Generally the bark is sold in ground-up chips and used to produce tonic or tinctures. The tonics and tinctures are generally made by steeping the bark in cold water for extended periods of time. The tree’s resin is among the bitterest substances on earth, so it can also be used to flavor liqueurs, jams, and puddings. 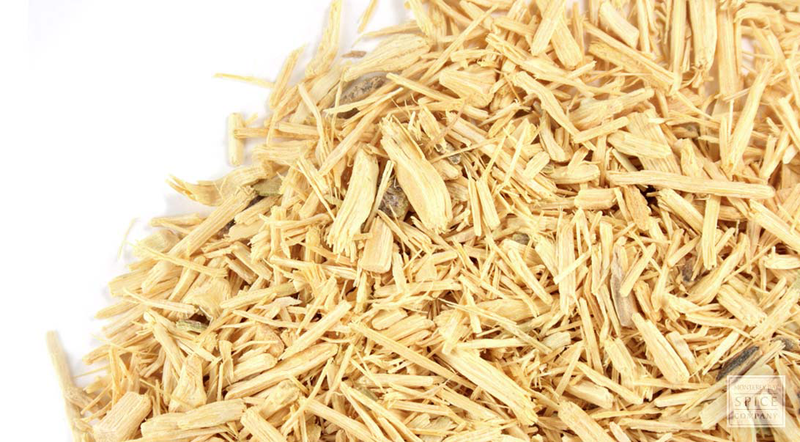 Fine shavings of quassia amara bark might also be used like hops to brew beer and ale. 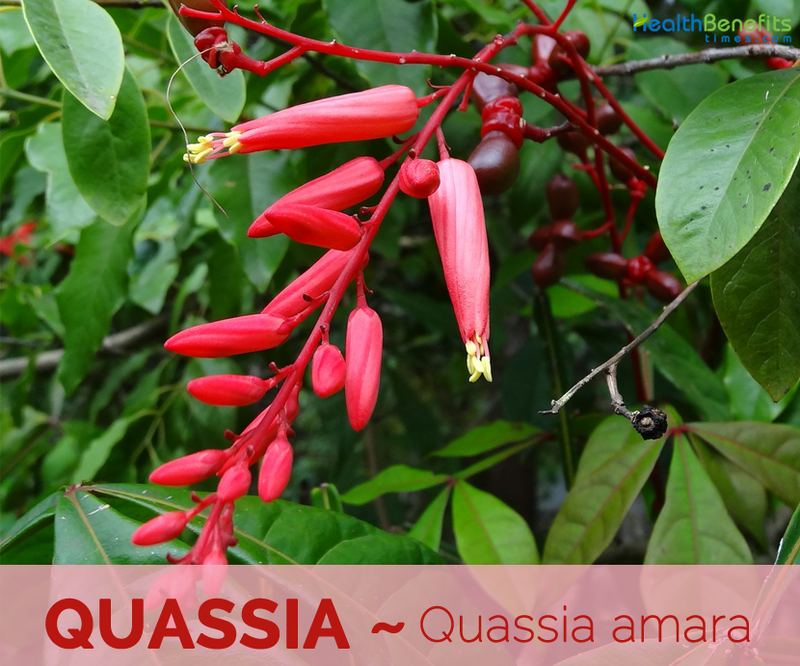 There are two varieties of the quassia amara tree that are used and grown for medicinal purposes. The West Indian type can reach heights of 100 feet (30.5 meters), while the South American variety is smaller, usually around 18 feet (5.5 meters) tall. Both types of trees are deciduous, with smooth gray bark and small flowers that produce black, pea-shaped fruit. 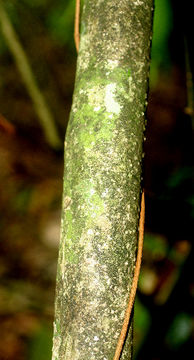 The trees are almost never eaten by insects because of the intensely bitter resin in the trees’ bark. Quassia is a small evergreen shrub or rarely a small tree that grows about 3 m tall (rarely 8 m) tall. 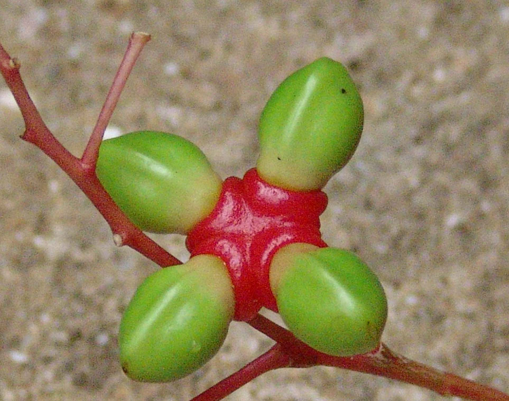 The plant is found growing in tropical forests or near bodies of water. Quassia cannot tolerate frost, but the plant is partially drought tolerant. It prefers a fertile, moist but well-drained soil in a partially shaded position. Bark is smooth, thin and dark brown or thick greyish brown transversed by reticulating lines. It is the bark of the quassia amara tree that is used in herbal and homeopathic medicine. The tonics and tinctures are generally made by steeping the bark in cold water for extended periods of time. 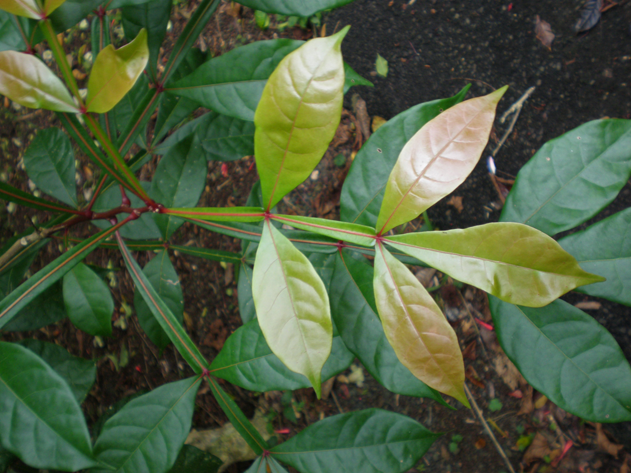 Leaves are compound and alternate, 15–25 cm long, pointed at the apex narrowed toward the base, and pinnate with 3-5 leaflets, the leaf rachis being winged. The leaflets are opposite, oblong, acuminate and uneven at the base. Flowers are produced in a panicle 15–25 cm long. The flowers are small and pale yellowish green. The sepals are round to ovate, fused at the base and imbricate. There are 5 petals, 10 stamens and 5 carpels. The style is fused from bottom to top. Flowering takes place from October and November. 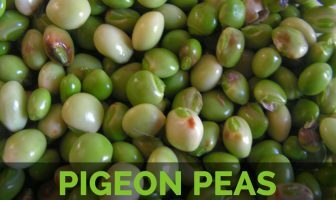 The fruit is a pea-sized drupe, which ripens from December to January. They are black, glossy, solitary, clavate and have a thin skin. 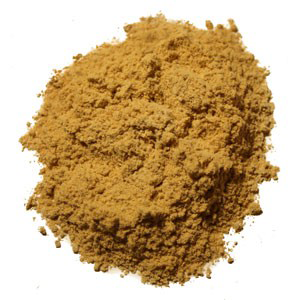 Q. amara is used as insecticide, in traditional medicine and as additive in the food industry. Tree’s resin is among the bitterest substances on earth, so it can also be used to flavor liqueurs, jams, and puddings. Root Infusion can be used to reduce malarial fever. Bark is boiled and the water drunk as an anti-diarrheal, as an anti-dysenteric, and as an antimalarial. Softened inner bark is boiled, and the water drunk to treat colds, by the Guyana Patamona. Bark and leaves are boiled, and the water drunk as an anti-pyretic. Wood chips are decocted in lotions for persistent venereal ulcers. Infusion of wood and fresh roots is used for refractory fevers, tonic, aperitive and febrifuge. Stem is used in remedies for diseases of the spleen, liver (cirrhosis), and urinary tract. Bark used as a blood purifier and for treating weak eyes of alcoholics. 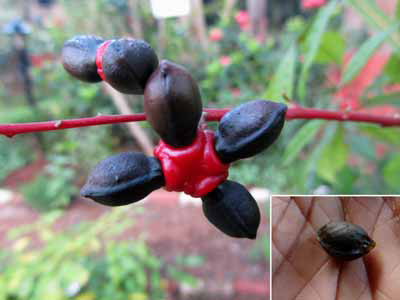 In Surinam, stem is used to make bitters for reducing a fever. 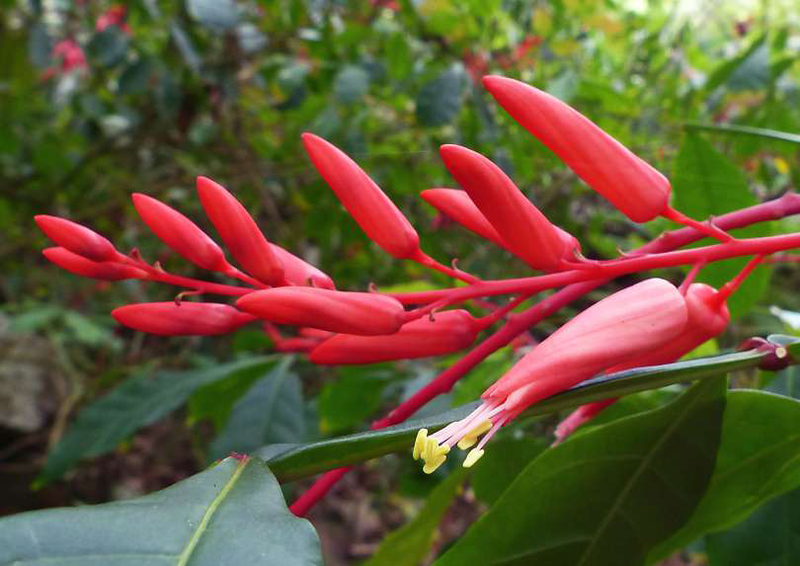 Quassia has been shown to encourage the secretion of gastric juices, increase the appetite and aid digestion. It has been used successfully in the treatment of anorexia nervosa and is also used in the treatment of malaria and fevers. All parts of the plant can be used on their own or in combination to restore the appetite, stimulate digestion and combat fevers, including malaria. Tea made from the infused leaves is used to bathe the skin of measles patients. It is also used as a mouthwash after tooth extractions. Decoction of the bark is used as a blood purifier and to treat malaria, diarrhea and dysentery. Decoction of the inner bark is used to treat colds. Stem and bark are used in remedies for treating diseases of the spleen, liver (cirrhosis), and urinary tract. Bark is used for treating the weak eyes of alcoholics and, macerated in rum, as a vermifuge. Combined with the macerated stem of Tinospora crispa in rum, cognac or absinthe, it is used to make a beverage for treating diabetes and albuminuria. Decoction of the wood is used in lotions as a wash for persistent venereal ulcers. 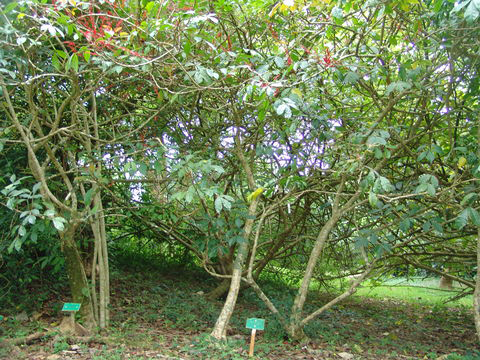 Decoction of the bark and leaves is used as a wash to rid the skin of external parasites such as agouti lice and as a treatment for measles and smallpox. Infusion of Quassia is also used as a lotion for pediculosis. Rheumatism: Use externally an infusion of bitter Quassia wood. Alcoholism: Prepare a tea of bitter Quassia leaves and drink one cup regularly. It kills the appetite for alcohol. Dandruff: Take bitter Quassia wood. Soak it in some water overnight. Now use this water as a scalp rinse for dandruff. 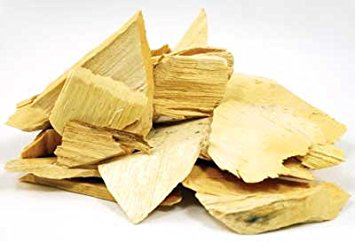 Stomach Problems: Take a cup made from Quassia wood. Put some water in it and leave overnight. Next morning drink it in empty stomach. It is a good bitter tonic for stomach. Tonic: Take a cup made of Quassia wood. Fill it with water and leave overnight. It becomes a good bitter tonic for the stomach. Worms: Add one tbsp of Quassia wood in one cup of boiling water and steep for 15 minutes. Take one cup regularly for a week. Bitter principle found in the bark and wood is used as the basis of Angostura Bitters, which is used as a flavoring in gin-based drinks. It is also used as a substitute for hops when brewing beer. Crushed leaves placed on body reputedly act as a mosquito repellent. Decoction of bark and leaves used as a wash to rid skin of external parasites such as agouti lice. amara is used as insecticide, in traditional medicine and as additive in the food industry. Extracts of Quassia wood or bark act as a natural insecticide. Extracts of Q. amara wood or bark are also used to flavor soft drinks, aperitifs and bitters which can be added to cocktails or to baked goods. All parts of the plant, but especially the bark and young stems, can be used as an insecticide. Excessive use may cause vomiting. Long term use should be avoided. Do not use during pregnancy (may cause uterine colic). Use over prolonged periods of time may lead to weakened vision and total blindness. French Guyana Creole: Couachi, Quinquina de Cayenne. Leaf Compound and alternate, 15–25 cm long, pointed at the apex narrowed toward the base, and pinnate with 3-5 leaflets, the leaf rachis being winged. The leaflets are opposite, oblong, acuminate and uneven at the base. 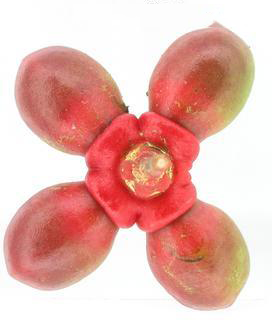 Fruit Shape & Size Small drupe 1-1.5 cm long, black, shining, solitary, globose, with a thin shell. 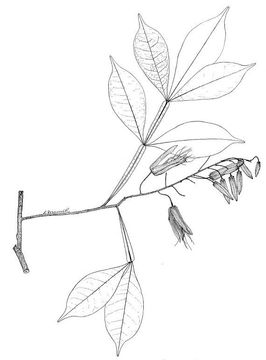 Quassia amara f. paniculata (Engl.) Cronq.